The Government is considering new rules and fines for car drivers, as part of a wide reaching safety review for cyclists. The Department for Transport is concerned that existing cycle laws do not provide adequate protection. As a result it has launched a public consultation to see how the rules of the road can be improved. According to police reports, 3499 cyclists were killed or seriously injured in the UK in 2016. The Government wants to cut this figure as part of its push to encourage more people to use a bike for shorter journeys - such as going to school, college or work. Among the ideas under consideration are fines and penalty points for drivers who travel dangerously close to cyclists or fail to give priority to travel straight ahead when the car is turning left. The driving test could also be updated, with learners required to demonstrate good practice of cycle safety in both the practical and theory assessment. The Highway Code currently requires a driver to leave "at least as much room as you would when overtaking a car". 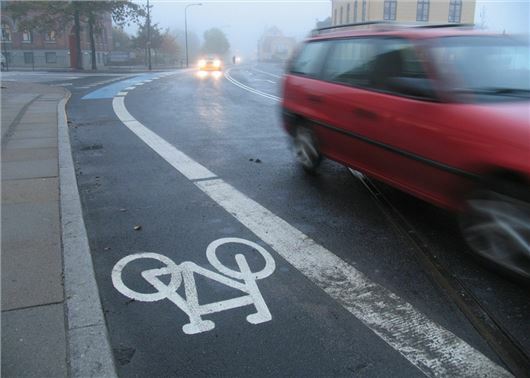 However, a minimum gap between a car and bike could be introduced along with fines for vehicles that drift into cycle lanes and junction boxes. The public consultation will run until 1 June 2018. Most cyclists ride on the footpath. Not a hope in Hell of getting me back on a cycle anywhere near a main road, dodging potholes and speed ramps in a car is bad enough, never mind on a bike. New Gizmo required for cars to automatically give cyclists the required space when overtaking, I really don't want to go near any of them in any case so try to keep a wide berth where I can. Allowing cyclists to go up the inside of cars and undertake a left turning vehicle is akin to suicide, don't do it. Now cyclists, don't approach me from the rear at speed without warning, on a pavement. Shame to see the usual anti-cycling sentiment in the comments. I drive a car, motorbike and pushbike. You've got to ride a pushbike so defensively. The number of cars who actively ignore bikes is unbelievable. I think it is about time someone in authority should say, "Yes' it is dangerous cycling on a road system designed for motor vehicles". However much a motorist is aware or takes care of cyclists around him/her, the basic fact is that a vehicle's speed is, usually, greater than that of a cycle and accidents will happen. A similar situation is that walkers and cyclists have different speeds but it seems to be that it is the walker who has to be more aware of, often bad tempered, cyclists silently creeping up behind them, even on pavements and country/canal footpaths. Why oh why can cyclists not fit a bell to their bikes, as a start, and save getting uptight when people are unaware of their approaching. All cyclists should wear hi visibility clothing. Against the law to ride two a breast. Against the law to ride on a road if there is a cycle lane. C. To pay for any damage caused to other motorists. I have been hit by 2 cyclists myself, on both occasions their fault and been given false details. On one occasion they were riding through a red light. On second time racing to beat lights they slide into my car. I agree with all of the above comments. No drivers deliberately collide with cyclists because it is cheap to do so. Increased penalties will not reduce the number of accidents and fatalities.Cyclists and underpowered vehicles are barred from motorways for safety reasons. The same logic should be applied to all roads. Vehicles and cyclists should be separated at all times. If new laws are to be passed to defend cyclists from cars, I sincerely hope that new laws will also be created to persuade cyclists to behave properly on the road. The majority of cyclists (and I'm not exaggerating) that I encounter will completely ignore traffic lights, stop signs, pedestrian crossings, left turn rules, roundabout rules and the need to show lights at night. They often ride as two or more abreast, forcing cars to slow down and creating frustration. This can lead to motorists eventually taking advantage of narrow opportunities to overtake, which can lead to accidents. When it comes to road safety, cyclists are often their own worst enemies. And until/unless they are obliged to carry registration plates and to pay for road usage, I don't see this changing. I drive a car and I ride a cycle so I see both sides. Consideration and manners would go a long way to solving many problems. I will say that I have cycled through France from the Med to La Manche on three occasions with no problems interacting with cars and then on the next day back home almost being knocked off my bike.I thought " Oh well I'm back home ". The cyclists I ride with ride in single file unless on a very wide and/quiet road. If you see a cyclist not using a cycle lane it may well be that it is covered by glass fragments thrown from a passing car. Most cyclists like myself are members of organisations which do provide personal and third party cover. I do not condone bad behaviour by anyone cyclist or not but remember that one the road the cyclist is far more vulnerable . There are good car drivers there are good cyclists , there are bad car drivers there are bad cyclists , its easier to fine car drivers. I, as the majority of adult cyclists, am both a cyclist and a motorist, I spend a lot of time in France, Switzerland and Spain where there is a long term culture of cyclists on the roads and mutual acceptance. The UK does not have such a culture, and it will take many years before cyclists are widely accepted, thus it may be necessary for the law to changed to encourage co-operation. The answer is for both motorists and cyclists to apply common sense, motorists give cyclists a wide berth whilst cyclists avoid blocking the way for cars. Cyclists should ride in single file on narrow country lanes, wear Hi-Vis and helmets for safety of themselves and other road users. Drivers should be aware of cyclists, particularly in built up areas, and when turning left. It is not 'Rocket Science', just a sensible approach to using the roads. Anyway HJ where's the Video?!! I would like to think I am good with cyclists giving them plenty of room, however, just to be able to fine motorists is just having another go at cars. There are good drivers and bad and good cyclists and bad, motorists have to pass a test have their car licensed, insured and have an MOT but cyclists can just jump on a bike and use the road (and apparently the pavement) without any testing being done on their ability or insurance cover. As a very (alas) long term cyclist, a car driver and a motorcycle rider I'm all for anything that increases safety for all road users. With punishment meted out on bad behaviour with the view to changing behaviour. That also includes cyclists. Living in N Wales which can often be a mecca for the Lycra brigade more so than commuters. Many times have I found myself in a queue of vehicles slowly winding our way up a country road, to find at the head of the queue "the chain gang" riding two and now more often three abreast. Grim determination not to ride single file or make allowances for other any other road users. On more than one occasion when overtaking such a group, a polite warning toot of the horn has raised jeers, V signs and even flying spittle. I started by saying I am a long term cyclist and have to admit having been seen in Lycra. But never in my 50+ years of cycling and 35+ year membership of the CTC, have I ever witness such anger and resentment from cyclists towards other road users as I do now. Yes, change the law but be proportional , the law must work for all. I’m car driver and cyclist. Just wish that roads were in a fit state to cycle on. Manholes and sewers either sunk in or proud. Potholes, cracks and craters. Speed bumps and cushions all over the place for no real reason, most a a knee jerk reaction to some stupidity that’s resulted in a death. Cycle paths ok if you’ve go them. But here Norfolk, not too many, and those we have are a bit of a hodgepodge after thought. Just too much traffic and a road policy that spends as Lille as possible to put patches in place rather than sorting out in a long term, comprehensive way. We have a roundabout near by that has had extra shopping areas feed in to it. It was overloaded when it was built and as the extra traffic has been put onto 8t there has been traffic lights, then yellow hatching, then work to widen, now there’s new layout. Still b*****ed, and always will be as a flyover is needed. But don’t hold your breath, be another waste of money doing more studies, the some other hair brain scheme. I’m car driver and cyclist. Just wish that roads were in a fit state to cycle on. Manholes and sewers either sunk in or proud. Potholes, cracks and craters. Speed bumps and cushions all over the place for no real reason, most a a knee jerk reaction to some stupidity that’s resulted in a death. Cycle paths ok if you’ve go them. But here Norfolk, not too many, and those we have are a bit of a hodgepodge after thought. Just too much traffic and a road policy that spends as Lille as possible to put patches in place rather than sorting out in a long term, comprehensive way. We have a roundabout near by that has had extra shopping areas feed in to it. It was overloaded when it was built and as the extra traffic has been put onto 8t there has been traffic lights, then yellow hatching, then work to widen, now there’s new layout. Still b*****ed, and always will be as a flyover is needed. But don’t hold your breath, be another waste of money doing more studies, the some other hair brain scheme. Yes I can agree with all that but for a bit of balance I have been out for a fifty mile bike ride today.I have exchanged friendly waves with drivers as they either gave way for me or I for them. So, somedays can be good ,notwithstanding all the road defects which are the very worst I have known. Nowadays I tell people if there is a stretch of good road surface and we take it for granted that rest are crap. One point I will make about cyclists is that the vast majority of adult cyclists are also drivers and many of my mates motorcyclists. So, really the vast majority have passed one or more tests. I think that MOST of the cyclists complained about here are either young and never had any training and I make no excuses for their bad behaviour or lack of lights. I have often thought that it would be a good idea for people who want to drive a car or ride a motorbike should have cycle training as part of the qualification process.This was something that used to happen naturally because prior to the sixties only the boss came to work by car and the rest of us walked, came by bus and many cycled. This progression would enable prospective drivers /motorcyclists to see the problems that we all face but from a cyclists perspective.